Cephalis cap-shaped to subhemispherical, with a dorsal sagittal furrow occupied by the apical bar which extends as a long, heavy, vertical, conical to three-bladed apical horn originating from the center of the upper surface of the cephalis. Pores of cephalis small, subequal, subpolygonal to subcircular; surface of cephalis with several scattered thorns or short spines. Cephalis separated from a broad, truncate-conical thorax by a distinct change in contour. Thorax separated from a broader, truncate-conical abdomen by a slight constriction occupied by a continuous, internal septal ring. Terminal margin of abdomen irregular; in fully developed tests numerous (8-12 or more), conical, terminal spines present, each originating from the apex of V-shaped distal extensions of the lattice. Pores of the thorax and abdomen similar, subequal but increase slightly in size distally, relatively large, elliptical or circular to subpolygonal, arranged subregularly in approximate longitudinal rows. Surface of both joints smooth or with a few scattered thorns or spines (up to 35 µm). Four large collar pores present; cardinal pores of type A; collar ring an indistinct rib separating cephalis from thorax. In a few tests the secondary lateral bars are prolonged as short thorns which originate from the dorso-lateral corners at the base of the cephalis. A short, conical to three-bladed vertical spine originates from the base of the ventral face of the cephalis. Indistinct ribs in the wall of the cephalis extend from the base of the apical horn to the primary lateral bars where they join with the collar ring. The dorsal and primary lateral bars extend from the collar ring as indistinct ribs in the wall of the thorax. The ribs terminate in the thoracic wall above the base of the thorax and are not prolonged into spines. Measurements; based on 10 specimens from stations 27, 34, 46, and 60: maximum length of test 101-197 µm; length of cephalis 20-30 µm, of thorax 55-98 µm, of abdomen 37-101 µm; breadth of cephalis 22-33 µm, of thorax 114-132 µm, of abdomen 116-212 µm; length of apical horn 15-63 µm, of vertical spine 6-12 µm, of terminal peristomal spines of the abdomen 15-65 µm. Remarks. Haeckel (1882, p. 434; 1887, pp. 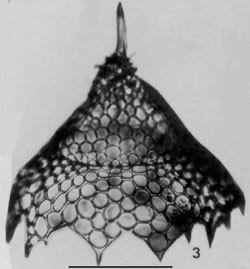 1385-1386) defined the genus Clathrocyclas as tests with a cephalis, thorax, and a dilated, truncate-conical or discoidal abdomen with a peristome having a single corona of terminal spines, and with no ribs in the shell wall. Except for the last, the Gulf species conforms to this definition. Its abdomen is truncate-conical and somewhat dilated. The dorsal and primary lateral bars extend as indistinct ribs in the wall of the thorax but generally are not prolonged as spines; instead, the ribs terminate above the base of the thorax. These ribs, however, are only apparent in apical or basal views of the test; therefore, they are easily overlooked. In specimens oriented with the axis of the test in or nearly in the optical plane, the ribs are not apparent; thus, in these views this species conforms to Clathrocyclas Haeckel. The only illustrated species with any degree of similarity with the Gulf species is Clathrocyclas cassiopeiae Haeckel (1887, p. 1390, Pl. 59, fig. 5) from the surface of the tropical Indian Ocean. Its abdomen, however, is shorter and the terminal peristomal spines are more numerous and much shorter. Whether or not this species represents an incompletely developed form of the Gulf species cannot be determined until Haeckel’s type material is examined; therefore, a new species name is not proposed. Distribution. This species occurs as far north as station 151 in the Gulf but is absent north of there as well as at stations 90, 99, and 130. It is very rare at the other stations in the Gulf. Its frequency is too low to permit analysis of its response to upwelling. Its absence at marginal and northern shelf localities indicates its preference for offshore, more nearly oceanic waters. It is present in slightly greater numbers at station 91 which is located within a region of upwelling. Whether its presence north of this station is related to upwelling cannot be determined.